Are you feeling the squeeze at your current office space for rent? Perhaps you’re a startup needing to move out of your garage and find office space quickly to accommodate your growth. Maybe you’re expanding your business to another city and you’re looking for cheap office space for rent to open a new branch. Whatever your situation is, searching for the perfect office space can be difficult, especially for first-time shoppers. Relax, take a breath, because we are here to help! There are many resources out there that can help you find affordable office space for rent! These websites and search tools take the headache out of searching for executive office space. You might also find that not all of these tools are created equally! After you read this, you’ll be well on your way to finding your perfect office for rent! MyPerfectWorkplace.com strives to relieve the stress and frustration of searching for the perfect office space. We differ from the bigger names in commercial real estate (which you’ll read about later in this post) in several areas! Firstly, and most important, we pride ourselves on a Customer First policy. When you’re searching for office space for rent, we want you to feel in charge and aware. We take the time to educate you on your lease terms, the different property types, the various areas in which you can find office space for rent. We want you to know exactly what you’re getting into! We work for you, not the landlord. When you call the telephone number in the upper-right-hand corner of this webpage, you’ll reach a real person who will gladly answer any questions you have about your search for office space for rent. This is a service not offered by our competitors. We work within your budget to find exactly the space for rent you need. 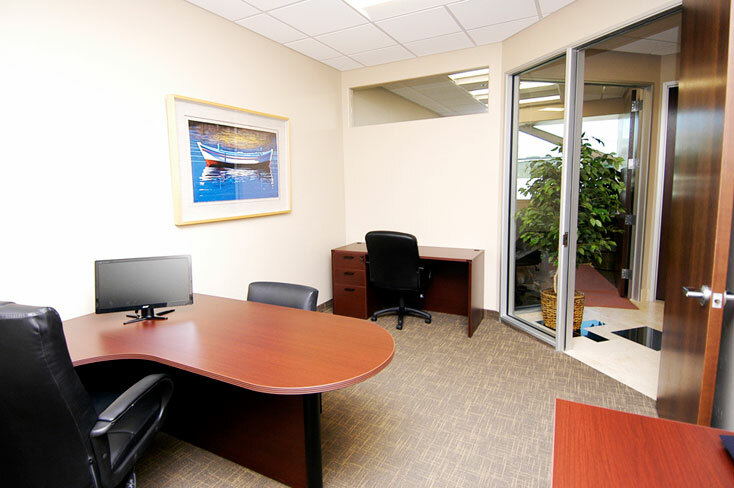 From small office space for rent to large executive office suites, there is no deal too big or too small for us! Our experienced brokers who have a vast knowledge of the commercial real estate market and our user-friendly search platform are unstoppable in finding your exact need: Your Perfect Workplace! LoopNet.com offers a search tool that allows you to find office space for rent in your desired area. This website is great if you already know what you’re looking for. You can filter by square footage, location, and office type. This search tool is ideal for veteran tenants, those who have searched for office space several times before and therefore know exactly what they need. Unlike MyPerfectWorkplace.com, LoopNet.com doesn’t offer personalized educational services. They won’t sit down with you and answer all your questions or fill you in on where to find the best office space for rent for the cheapest price. It’s purely a search tool. Though they offer thousands of listings and many commercial real estate brokers advertise their properties and contact information here; LoopNet is not a tenant-centered company. This website primarily caters to landlords and brokers looking to get their properties listed. If you did a quick look at the products that LoopNet offers, you’ll notice that the products they offer are only for advertising office space for rent, brand marketing, and other landlord services. In fact, if you call LoopNet.com, you won’t reach a human; you’ll reach a recording and a list of options that really don’t help you get to where you need to go. 42floors.com is also a great search tool for finding office space for rent. Though not quite as user-friendly as MyPerfectWorkplace.com and LoopNet.com, 42floors.com does have several listings to search through. Each listing offers information like the number of floors, square footage, a short blurb on the property written by the broker, and pictures. 42floors.com differs from LoopNet.com in the information it provides about the different properties, but otherwise, it’s pretty similar. The focus is on advertising listings, not providing helpful information to prospective tenants. Much like LoopNet.com, if you were to call the 1-800 number you won’t reach a live human being, you’ll reach a recording of a human being. 42floors.com is a great search tool, especially for hot markets like Los Angeles, San Francisco, San Diego and more. MyPerfectWorkplace.com differs in that we provide listings for several smaller cities as well as the hotter markets, like Menlo Park or Redwood City. Overall, 42floors.com is a helpful resource for searching once you already know what you want. There are several other search tools out there that can offer you exactly the same service that LoopNet.com and 42Floors.com offer. CityFeet.com and Craigslist all provide listings that agents have posted and information about square footage, type of office space for rent, price, location, and more. These websites will give you pictures and allow you to try to contact the listing brokers, however, more often than not, your request for information gets lost in the shuffle. These websites simply don’t offer the education and first-hand help that MyPerfectWorkplace.com can provide. This is not an exhaustive list of resources you have at your disposal when searching for commercial office space for rent. When looking at all the options, you might find yourself asking “Where do I go from here?” If you know what you’re looking for, start your search at any one of these great resources. However, if you’re like most businesses looking for commercial space for rent, you’ll want guidance. You’ll want to know for sure that you’re getting the best deal possible! Of these options listed above, the only one that will guide you through the process of finding office space for rent is MyPerfectWorkplace.com.